Wall mount mailbox is constructed of a durable polypropylene. Weather and rust resistant. Front panel has a classic decorative engraved design. Comes fully assembled. Size: 7.9"H x 15.5"W x 4.7"D. Lockable wall mount mailbox constructed from rust-resistant galvanized steel and has a durable powder coat finish. For security this mailbox has a concealed cam lock and comes with two keys. Its medium capacity can hold magazines and large envelopes. Optional decorative emblem included. Size: 12.6" H x 9.7" W x 4.4" D. Mounting hardware sold separately. Lockable wall mount mailbox constructed from rust-resistant galvanized steel and has a durable powder coat finish. For security this mailbox has a concealed cam lock and comes with two keys. Its medium capacity can hold magazines and large envelopes. Optional decorative emblem included. Size: 12.6" H x 9.7" W x 4.4" D. Mounting hardware sold separately. Gibraltar Security Mailbox, Lockable, Series: Designer, 9-5/8 in Width, 4-3/8 in Depth, 12-1/2 in Height, Wall Mounting, Concealed Cam Locking, Galvanized Steel, Venetian Bronze, Includes: (2) Keys, For used to hold wide pieces of mail, such as magazines Medium wall mount mailbox is constructed of heavy-duty galvanized steel with a textured finish. Fully assembled. Mounting hardware sold separately. Size: 9.8" H x 16.6" W x 4.5" D. Medium wall mount mailbox is constructed of heavy-duty galvanized steel with a textured finish. Fully assembled. Mounting hardware sold separately. Size: 9.8" H x 16.6" W x 4.5" D.
Heavy-duty plastic and aluminum construction. Features heavy-duty cam lock with 2 keys. Internal mail tray holds outgoing mail. Rustproof. Deep, large capacity. Size: 13.3" H x 17.1" W x 8.4" D. Heavy-duty plastic and aluminum construction. Features heavy-duty cam lock with 2 keys. Internal mail tray holds outgoing mail. Rustproof. Deep, large capacity. Size: 13.3" H x 17.1" W x 8.4" D. Large capacity locking wall-mount mailbox. Made of 14 and 16 gauge welded steel construction with stainless steel hinge. Exclusive anti-pry latch to prevent leveraged entry, locking access door with commercial grade 12-disc wafer lock. Includes: Installation instructions, reflective house numbers, all necessary hardware, vandal resistant flag and three (3) keys. Durable powder coated finish. 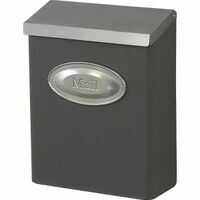 Dimensions: 16.1"D x 15.8"W x 7.5"H.
Large capacity locking wall-mount mailbox. Made of 14 and 16 gauge welded steel construction with stainless steel hinge. Exclusive anti-pry latch to prevent leveraged entry, locking access door with commercial grade 12-disc wafer lock. Includes: Installation instructions, reflective house numbers, all necessary hardware, vandal resistant flag and three (3) keys. Durable powder coated finish. Dimensions: 16.1"D x 15.8"W x 7.5"H. Large capacity locking wall-mount mailbox. Made of 14 and 16 gauge welded steel construction with stainless steel hinge. Exclusive anti-pry latch to prevent leveraged entry, locking access door with commercial grade 12-disc wafer lock. Includes: Installation instructions, reflective house numbers, all necessary hardware, vandal resistant flag and three (3) keys. Durable powder coated finish. Dimensions: 16.1"D x 15.8"W x 7.5"H.